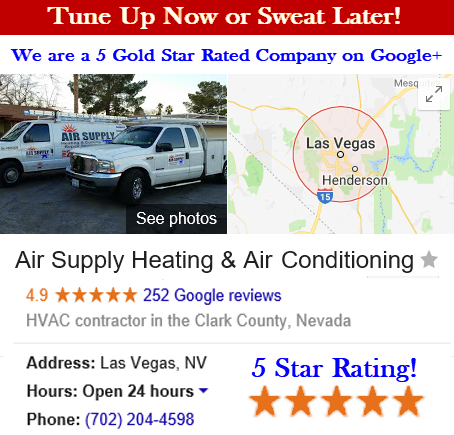 In a climate like ours in Las Vegas, we understand that a properly and efficiently running heating and air conditioning system is essential for the comfort, health and safety of your family and friends and/or your employees and customers. And we know that emergency repairs always seem to happen at the worst times! In case of emergency, we always have HVAC technicians standing by 24 hours a day, 7 days a week! When you need HVAC repair and you contact Air Supply Heating & Air Conditioning, you can rest assured that our experienced and friendly service technicians can help you get your system up and running again quickly. •	Unbeatable Prices – we will beat any written estimate by 10%! 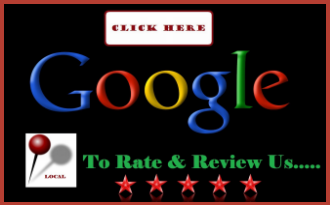 •	100% Guaranteed – All repairs are 100% guaranteed and backed by a part and labor warranty. CLICK HERE TO LEARN MORE ABOUT OUR EMERGENCY AIR CONDITIONING REPAIR SERVICES! No other single system in your home plays a larger role in either your comfort or the cost of your utility bill than your heating & air conditioning system. In fact, according to the United States Environmental Protection Agency, heating and cooling adds up to as much as 50% of your utility bill! Old, outdated systems can leak and cause water damage and they simply are just not as energy efficient which adds more to your utility bill each month. 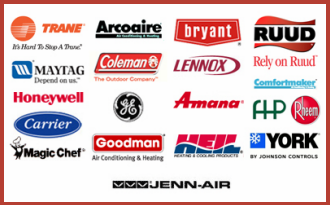 Air Supply Heating and Air Conditioning specializes in cost effective and high efficiency HVAC solutions, including air conditioners, swamp coolers, natural gas, oil and electric furnaces, electric heat strips, gas and electric heat pumps, air quality systems, air ducts and thermostats. We design and install systems to be the most cost effective on the market and geared to our local Las Vegas climate and your specific property. By upgrading to an energy efficient furnace and central air conditioning system, you’ll see a dramatic difference in your utility bills. If your current heat pump or air conditioner is more than 10 years old or your furnace is more than 15 years old, it may be time to replace them. A high efficiency system from Air Supply is geared to keep your whole house or business comfortable while keeping your utility costs low. 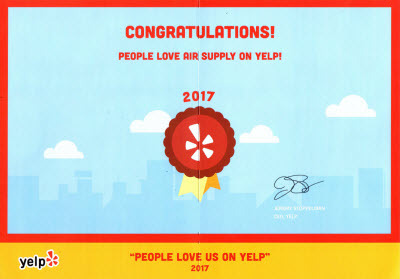 Air Supply Heating and Air Conditioning has earned a reputation for quality installations (just read some of our customer reviews). All of our installation crews take great pride in their work and the end result is a clean installation, a fully working and efficient system, and improved air quality. CLICK HERE TO LEARN MORE ABOUT OUR EMERGENCY AIR CONDITIONING INSTALLATION SERVICES! To save money on utility bills and the inconvenience and stress of emergency service calls, Air Supply Heating and Air Conditioning urges you to take a preventive approach to your heating and cooling needs. We believe that all of your heating and cooling systems should be included in a regular inspection and maintenance program to prevent costly repairs or even premature replacement. Properly maintained equipment by Air Supply lasts longer, functions more efficiently and saves you money on your utility bills! In the Las Vegas area, temperatures can rise to 115 degrees in the summer and have been known to drop to the teens in the winter. Most equipment failures occur during these extreme temperature periods. Our trusted Maintenance Agreement from Air Supply Heating and Air Conditioning moves yourself to the front of the line! Of course, every once in awhile, systems do break down and need repairs. Our maintenance Agreement customers save up to 20% on repairs and parts! Getting your HVAC system checked twice a year is just as important as changing the oil in your car every 3,000 miles! Indoor air pollution can actually be worse for you that outdoor pollution as indoor air can be to up 70% more polluted! People spend most of their lives (as much as 90%) inside their homes and office buildings, so clean indoor air with the right humidity level and low levels of particulates, dust and contaminants is of the utmost importance for day to day health and comfort. According to many experts, house dust contains mold, viruses, dust mites, pollen, decaying organic manner, skin flakes, pet hair and dander, bacteria, textile fibers and residue from chemicals and household products. The NEMI (National Energy Management Institute) reports that the benefits of improved indoor air quality are so huge, they cannot be ignored! Benefits include reduced sick leave, improved productivity, increased profits and better health with reduced costs. If you want cleaner and healthier indoor air, Air Supply Heating and Air Conditioning can help supply and install the latest air filtration systems, air decontaminating UV lamps, humidifiers and dehumidifiers. Carbon Monoxide is a dangerous gas that you can’t see, smell or taste. It can build up undetected in enclosed spaces in your home. Our well trained technicians know where to look and how to test for possible leaks and any faulty equipment that can be contaminating your home and family (or business, employees and clients) with this deadly and poisonous gas. A home or office is only as clean as its heating and cooling ductwork! A clean and well maintained air system helps your heating and cooling system run more efficiently and also creates a more comfortable, healthier and safer indoor environment. Air Supply Heating and Air Conditioning can reduce utility bills by increasing the volume of air flow at the registers and diffusers, remove any present mold and mildew from your duct work, lessen the amount of dust in your home, eliminate musty odors caused by a neglected system and improve uneven temperatures from room to room. Whether you’re ready to improve the air quality of your home, commercial building or apartment complex, we’re ready to provide the duct inspection and cleaning services you need. A clean duct and HVAC system can improve indoor air quality, create a more comfortable interior environment, save energy and lengthen the life of your system. We offer compete duct cleaning for your HVAC system – coils, coil drain pans, plenums, air filters, ducts, fans, vents and registers. Air Supply Heating and Air Conditioning uses a state of the art vacuum system powered by a 1.5HP blower that delivers 1800CFM of suction. This means that once the contaminants are broken loose, this vacuum will remove and trap everything. The filtration in our vacuum system is a 3 stage with HEPA. 1st stage is a prefilter. 2nd stage is a MERV 11 pleated bag filter and our 3rd stage is a 99.97% HEPA filter. The combination of these 3 filters will ensure that all harmful contaminants are trapped and nothing but clean, fresh air is circulated back! CLICK HERE TO LEARN MORE ABOUT OUR EMERGENCY AIR DUCT CLEANING SERVICES! CLICK HERE TO LEARN MORE ABOUT OUR DRYER VENT CLEANING SERVICES! A ductwork inspection from Air Supply can identify problems like the degradation of fiberglass-lined ductwork and improperly sealed ductwork connections. Identifying these problems early can save you costly repairs later and keep your home or business environment healthier and safer. Many business and homeowners don’t install the right type of filter for their specific system or they are just too busy to clean and replace them on a recommended schedule. Improper or unclean filters create additional stress on your HVAC system and cause your indoor air quality to decline dramatically. We inspect, clean and replace your filters immediately if necessary. We also provide the information you need to replace your filters in the future, on the schedule recommended by the manufacturer. Air Supply Heating and Air Conditioning offers one of the most complete system inspections in the valley. Don’t be fooled by other companies’ 15 to 20 point inspections! Ask for Desert Comfort’s 43 Point Inspection and rest assured that your system will keep operating like it should. *Outside A/C unit (condenser) *Condensing unit cabinet *Condenser pan *Condenser coil (cleanliness) *Condenser coil (leaks) *Condenser coil (fins) *Condenser fan motor *Condenser fan blades *Contactor *Capacitors *Electronics/wiring/terminals *System amperage *Compressor *Amperage *Compressor terminals *Compressor temperature *Compressor saver (hard start) *Time delay *Temperature difference *Refrigerant level/pressure *Saturation temperature *Refrigerant service ports *Leak search required *Refrigerant line set *Outside electric disconnect *Wiring from disconnect to unit *Thermostat wiring *Surge/lightning protection *Inside (cooling components only) *Air Filter *Air Handler Cabinet (cleanliness) *Supply/return plenum(s) *Air Handler Cabinet (condition) *Condensate Drain pan *Condensate Trap *Condensate Drain lines *Ceiling savers (float switch) *Blower motor/wheel *Blower motor capacitor *Evaporator coil (cleanliness) *System sterilizer stage 1 *System Sterilizer stage 2 *System sterilizer stage 3 *Wiring *Thermostat *Circuit boards/electronics.